Here posting a chat that I had with one of the aspirants. Some of it might be useful for budding surgeons who want to appear for MRCS. Hi..I recently read your blog on MRCS exam preparation. I was wondering if you could help me with some information. 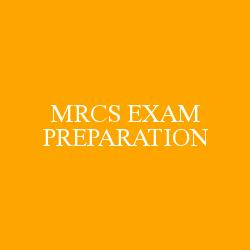 I want to know the requirements and eligibility criteria for MRCS exam and how to go about it. I want to give the part A in September 2017. I am looking forward to your reply. Thank you! You should hold a primary medical qualification that is accepted by the United Kingdom General Medical Council..
Thats it, then you have to register for MRCS part a exam and you ll have to send your degree documents verified by your professor/ consultant along with Forms provided. You can choose to give exam with any of the Royal colleges of surgeons, each conducts a separate exam. I have completed my MBBS from Russia and I have registered here in Maharashtra medical council..so you mean to say that I would require my degree to be verified by a professor from my university in Russia? And is MRCS from any of the 4 Royal colleges of surgeons recognised by Medical council of India? Ok...do I require a experience in surgery department??? No experience is required, but it is difficult to pass MRCS Part b without basic surgical experience. If I may ask, why do u want to get MRCS? You should be clear about its purpose. With MRCS you cannot practice surgery in India.. It is just a qualifying exam of royal college membership. Sort of like Indian PG entrance or USMLE. After these exams you don't gain any skills. Yes...but after part B...we have to go through the training programme as well, right? After part b once u have a MRCS degree, you are eligible to apply fot GMC Registration(Like MCI Registration). So why have you given this exam? Do you wish to work in the UK? It gives me opportunity to apply for jobs/ fellowships in UK, New Zealand, Australia. But after pg entrance exam, we get to enter a residency programme, so in this case also it must be the same right? A person wanting to be a surgeon would write MRCS, a person wanting to be Physician would write MRCP exam. Thats how it works in UK. Then based on your CV they select you for a job/ residency program/ fellowship. Have you done your MS in India? So you don't want to work in India? But MRCS does not give u any surgical experience. How will you do surgery? It may be valid for promotions and all, but definitely not for practice. Its a backup option for me, in case I don't get a MCh, I may try for a fellowship outside. So, after clearing MRCS part B, one can apply for fellowship programmes there in the UK? That is after part B, right? Is MS done from any other country valid? Or do they have specific countries only?I have done MS from Russia...am I eligible for MRCS? I mean, if I go for this exam, I can apply for fellowship? Do I have to give IELTS for part A? Ok..Thank you so much for your time.. Thanks a lot!